I was wondering what everyone thought were the best skylines in each category of metro areas. We all know that New York and Chicago stand above the rest, but what about the rest of the skylines? I'm curious to know your opinions and your thoughts. If you'd like to post pictures or whatever, that's fine, and thanks for your time. 5+ million: NYC or Chicago. There's already been lots of debate over this. 1-2 million: Gotta go with Vegas. Not a normal skyline, but I think it's the best of the 1-2 million cities. 0-500,000: Well, you did miss a lot in this area. There are lots of cities in this category. From what I've personally seen, been a washingtonian, I'd say Bellevue, but I haven't seen all the cities in this range. Last edited by JMT; 10-25-2012 at 08:12 AM.. Doesn't the Bellevue count into the Seattle metropolitan area? Yes, I agree with you on that. It already has 3 buildings over 400 feet, and has a couple more coming. Also, Sacramento should be in the 2-5 million category. Last edited by JMT; 10-25-2012 at 08:13 AM..
Last edited by JMT; 10-25-2012 at 08:14 AM.. There aren't even a million people on Oahu so Honolulu can't be in the 1M-2M range. +5m: Outside of NYC and Chicago, I think Dallas has the best skyline. Interesting architecture plus the iconic Reunion Tower building. 2-5m: Seattle, hands down. Space Needle and Columbia Seafirst are awesome. Denver's a close second in this category. 1-2m: Right now I'm partial to Kansas City, for the density of their downtown, plus the art deco Power and Light building, which I think adds something historical that other newer metros don't have. I also think this category has the most potential for change. If for example, Austin continues building skyscrapers or Louisville builds that bizarre building censusdata posted then they could take the title. 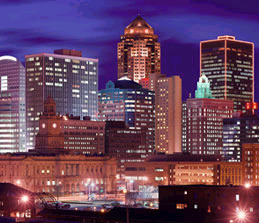 500k-1m: I'm biased here, but I like Des Moines. Good density of the skyline, variety of buildings. However, unless they start building some high rises instead of the mid-rises they've been building lately, they'll lose out. 0-500k: For natural beauty nothing beats Anchorage. For building height, variety and density, I like Mobile. As a side note, I'd be interested in seeing what people think are the best, smallest skylines. I'm thinking specifically of cities under 100k.